A subject that I had to learn about in the course of engineering the chumby is injection molding. For an electronics guy with little mechanical background, this is not a small hill to climb. The concept seems simple: you make a cavity out of steel and you push molten plastic into it at high pressure, let it cool, and voila, a finished part comes out. Just like the Play-Doh molds from elementary school! Oh if only things were that simple. Fortunately, we have experts in China who know all about this, and I get to learn mostly by watching. If I were to summarize injection molding with a single adjective, it would be “precision”. The molds are precise to better than hair-thin tolerances, yet they are made out of hard steel. Achieving this level of precision out of such a durable material is no mean feat. It’s impressive to see a mold being cut out of raw steel. The machine above is moving around a block of steel that weighs probably several hundred pounds in quite a hurry! Below is a photo of the whole machine, so you can get a sense of how big it is. However, this is only the roughest step in mold making. After the rough shape is cut out, the mold is put into a machine called an “EDM”–Electron Discharge Machine–where a burst of electrons are used to knock microscopic chunks off the steel surface. If this sounds like a terrifically tedious process to you, it is. I’ve watched many EDMs do their job and it’s like watching paint dry (which is why I don’t have a video of it here). However, these things are wicked precise and they yield spectacular, repeatable results. All told, a mold transforms form a block of raw steel into a first-shot tool in about 4-6 weeks. I think, from a project management standpoint, the phenomenally long lead times of production-quality injection molded plastics was the biggest eye opener for me. I had to go to China and see the tooling shop do its work before I was convinced that there wasn’t some gross amount of schedule padding going on. What’s even more harrowing from the risk management standpoint is that there are no good simulation tools (to my knowledge) to predict how plastics will flow through the mold. So those visible blemishes like flow lines and knit lines? Well, you have to wait 4-6 weeks to see if you got it right. Ouch! Fortunately, the toolmakers we use in China anticipate this and they make the tools so as to err on the side of having excess steel, because it’s much easier to remove material to fix a problem, than it is to add material. Sort of like the old carpenter’s saying of measure twice, cut once, and if you have to cut wrong, cut long. You can see that there are actually two molds, and one side of the mold spins around so that the alternating material systems can be molded at the right points in the process. Just as a bonus, I swiveled around at the end of the video to show you an unrelated product where a robotic arm is doing the mold extraction. The part is a very high-gloss part and a robot arm is used to prevent getting fingerprints or nicks on the work piece as it is still soft from the heat of the mold. High-gloss steel molds are really impressive to see in real life, because the exposed mold surfaces are mirror-polished. I don’t have a video of this, but all of the steel surfaces that are exposed to the end users’ eyes are hand-polished by a crew of women. They spend days rubbing and picking at blocks of steel using specially cut bamboo rods, cotton swabs, and very fine grit polish. This step happens after the EDMs are done doing their thing, or anytime the mold has sat unused for a long time or has been opened for rework. There is a lot of hard work that goes into those humble plastic parts! This entry was posted on Tuesday, September 11th, 2007 at 5:15 am and is filed under chumby, Made in China. You can follow any responses to this entry through the RSS 2.0 feed. Both comments and pings are currently closed. I remember hearing a talk years ago when I worked at Apple by the guy responsible for plastic there. Mold making required incredible experience, all of the people doing it had been working at it for decades. The molds for machines like the Mac Plus and Mac SE were incredibly complex with many custom moving parts. Initial tooling on one was something close to $1M. Apple bought a Cray in the late ’80s to simulate the plastic flowing through the mold, to help predict where problems would be. For injection molding simulations you need Moldflow (http://www.moldflow.com/stp/). While this isn’t necessary on everything, it is advisable to get this done as the part complexity increases or the nominal wall decreases (and more so if you are building multi-cavity tools). That being said, it is only a tool and garbage in = garbage out. I am a budding entrepeneur trying to get a small plastic product made in China. Would you mind telling me who your factory is and if you like their service and prices? thanks. FYI, your video auto-plays on page load. For a single video, this isn’t so bad, but when I go to your blog index page, my browser suddenly chokes. Something about playing 6 or 7 streams simultaneously… I’d imagine your bandwidth costs are pretty out there, too. Dave – Check out http://www.openps.com they are a Solutions company who work with Chinese Plastic Mould and Tooling Producers. 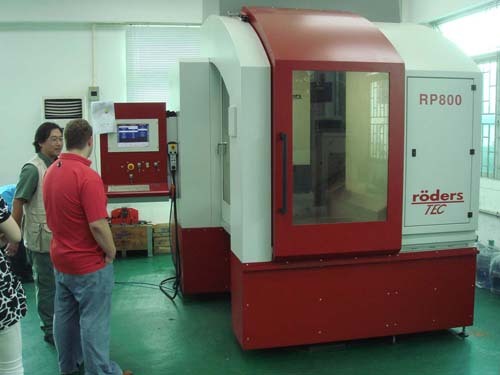 EDM stands for Electrical Discharge Machining, rather than Electron Discharde Machine. at http://www.titoma.net we have western engineers managing a group of Chinese mold makers. I would have to warn against wiring your money to just any internet site of a shop you have never visited. As Brian said above – MOLDFLOW is the ticket for injection molding simulations. I understand it’s an expensive software package, but so far all the shops I’ve worked with in China have a (most likely) pirated copy of it. But it’s certainly not a silver bullet – I depend heavily of the experience of the shop I’m working with…. As a product development engineer for 20 years and then a Plastics Engineering and tooling company owner for the past ten I like the discussions and they are all real interesting. Our firm takes our 30 years of experience, designs parts that are moldable and toolable and we either make in USA very efficiently or send to our Chinese affilate depending on the customer goals. Do not go to China on your own as there are many more bad choices than good. web-sites can make bad companies look good. We can give you very consultative help to meet or exceed your goals and have 22 patents for our customers to show for it. 269-323-0388 is the help line of honesty, integrity and experience. We are the Czech company and our clients was go produced to China, now they go back, because there is not day bay day personal control from client, this production in China is, by me, only for simple moulding, no? What side is the core typically on? The moving platen? Which platen is typically called the A side? as well as which is the B side? Karen, for a simple mold, the core is typically on the moving platen. Normally the plastic would hold the core and not the cavity as it shrinks and it must remain on the moving side where the ejector mechanism is located to facilitate proper ejection. I’m not sure about the A side and the B side but I think the A side is on the fixed side (stationary) and the B side is on the moving side. The mold base catalog that I use has A-plate on the fixed side and B-plate on the moving side. Wow, if a manufacturing company in the US had an operator open the safety door of the machine and rotate the platten like you have on video someone would be arrested. At the least OSHA would shut you down and write you up. Can you visualize a broken arm happening here? Best wishes from ShenZhen China ! I am very glad to know your esteemed company from internet and writing to you to explore the possible cooperation with you in plastic mold. Please forgive me if bring you any trouble. WayYes Mould Engineering Ltd focus is injection mold. DME and HASCO are our standard model. Advanced software such as Pro/E, UG, Solidworks, AutoCAD is applied proficiently. The factory produce about 300 sets of toolings each year and most are exported to North American and Europe countries. The production cover electrical appliance, audio, automotive, construction tube and etc. Our engineers are very professional and also with good ability in English. The Operating Concept Of WayYes Company is Quality,Efficiency,Service and Win-win cooperation. We would like to welcome you to visit Wayyes at any time. WayYes Mould Engineering (HongKong) Co., Ltd. I had to agree with the response posted by Dave Martin if this discussion thread was posted 3 years back. The progress in China over these years had been so dramatic & credit will have to be given to those hardworking folks. I had observed, over the past 2 years, that they had indeed picked up ‘tricks’ of this trade at a very rapid pace. Another easier approach is to engage the services of injection molding firms in countries familiar with both the West and the Chinese system (e.g. Singapore) to help you with initial development (mold-making, product design review, etc) of your products. Once when the design is fixed, it will be much easier for you to launch for mass-production from that intermediary country. Regards; & Cheers to the internet for bringing the world closer! Wholesale and drop ship electronics from China. great article, I was looking for just basic information on the whole plastic moulding process. thanks very much for posting. Exactly the same as one of our machines! I love how cultures, languages etc may be completely different, but human methods of building the same types of machinery and working practices are exactly the same across the world. Mingsheng Mould is one of the leading plastic mould manufacturers in China, can offer you top quality moulds with reasonable price and on time delivery.Please feel free to contact me for any further information. There is no better way of abdominal fat loss than to eat balanced foods as well as a nourishing diet. Indulge yourself in to activities that will let you sweat. Do cardio exercises or try walking, walking or walking. There’s so lots of things that you can do to encourage fat loss. Weight training has the ability to increase lean muscle mass as well as your metabolic rate. This means that you can burn fat even when you are resting. So now, try to look for activities that may encourage flatter abdomen. Great Blog for education. Prototype molds don’t have to be built in China. 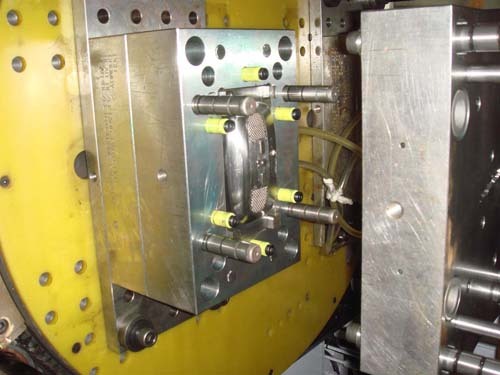 There are many companies that can produce molds in the US for competitive prices. Remember to consider all aspects of cost including WIP when working with any vendor. Working with low overhead but knowledgable vendors in local markets has benefits often including legal benefits as well. The machine above is moving around a block of steel that weighs probably several hundred pounds in quite a hurry! There’s all kind of nuances to the process. Plastic flows, but it’s not particularly runny.